St. Tropez is the stamping ground of the international jet-set. Residence Royale selected a lot of exclusive and luxury villa rentals in and around St. Tropez with its famous beach clubs. Rent one of our luxury holiday villas and have an unforgettable holiday in St. Tropez. Holiday villa Tamarinde lies in the hills near Ramatuelle on the Côte d'Azur (France) only 300 m. from the beach. Lovely Provençal style villa for 8 with 4 bedrooms, 4 bathrooms, air conditioning, WiFi interne, private pool with Jacuzzi bath and breath taking sea view. It is only a few minutes by car to Ramatuelle and St. Tropez! 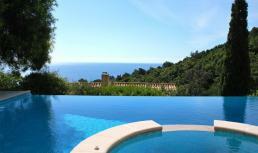 Holiday villa Bari lies in the hills near Ramatuelle on the Côte d'Azur (France) only 3 km. from the famous beaches such as Pampelonne beach. Lovely Provençal style holiday villa for 14 with 6 bedrooms, 6 bathrooms, air conditioning, WiFi interne and large infinity pool. Ideal holiday villa for a family holiday! Holiday home Ortris is for rent in the outskirts of St. Tropez. Lovely holiday home with 4 bedrooms, 2 bathrooms and private pool, surrounded by a fenced garden of 1900 m². The famous harbour of St. Tropez is only a 10 min. walk away! Villa Castel is for rent in the domain de Castellane in St. Tropez (French Riviera), close to the village and the beach. Lovely vacation villa for 8 with private pool, air conditioning and WiFi internet!